Yoga is derived from the Sanskrit root ruj, meaning to unite. 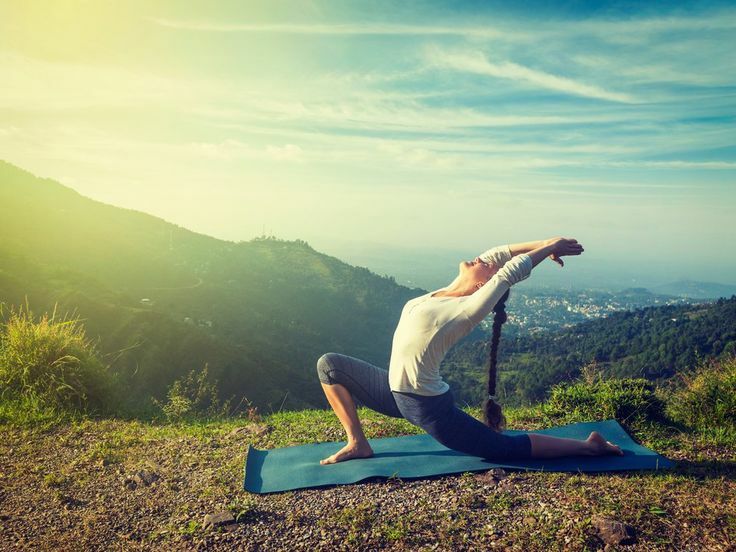 The health benefits of yoga are united on and off the mat. Oftentimes people associate yoga with its physical benefits, such as increased strength and flexibility. But just as important are the emotional health benefits. Practicing yoga can improve concentration, relieve depression, and reduce stress. Imagine seeing deep beneath the surface of a still lake. If a rock is thrown into the water, the ripples make it difficult to see clearly. When the mind is calm and free from excessive thinking, one can see and think more clearly. One main element of a yoga practice is pranayama (breath control). Focusing on the breath takes one out of their head and into the present moment. Deep breathing also improves concentration by bringing oxygen to the brain and body. Buddhism's idea of "froglessness" illustrates the restless mind. If someone sets a frog in the center of a plate, it will jump off the plate in a few seconds. If they put the frog back, it will soon jump off again. It's difficult to keep the frog still. The mind is constantly hopping away from the present moment. Yoga helps keep the mind centered and continues to bring one's awareness back to the moment. What's more, research has shown that a consistent yoga practice can improve concentration. A study of 84 students at California State University San Bernardino measured the heightened concentration from practicing yoga. The students took four 10-week Hatha yoga classes and completed assessments two weeks and nine weeks into the class. In just eight short weeks, there were significant increases in the participants' concentration and motivation. Yoga is not only a physical practice but a mindful practice. Day after day the ego controls the way many people live their lives. Ego is everything outside of oneself – a job and the amount written on a paycheck, responsibilities and to-do lists, addictions to television and alcohol, and soul-destroying routines. Practicing yoga is a way to break away from the ego, a way to tune out the outside world and turn within. Turning within gives one a chance to relinquish their self. Self is hard to define but can be thought of as an observer to the physical body, thoughts and feelings. This introspection nurtures the things that truly matter, which actually aren't things at all – what makes one's heart sing and what one's purpose in life is. Someone who takes control of their mental and physical health can be pulled out of a depressed state. A cairn is a pile of stones. Cairns can be found alongside trails as hikers add stones when they walk by. Like the stones, emotions build up over time, causing tension and pain in the physical body. Picking up one stone at a time, peeling off one layer at a time, is essential in coming back to one's true self. Yoga gives one permission to feel everything there is to feel, and by doing so, repressed emotions are lifted. Changing the biochemistry of the brain by raising the levels of neurotransmitters such as serotonin can help treat depression. Practicing yoga is one way to raise levels of serotonin. Stress is a part of every day life. While one can't always control their life situation, they can control their attitude. Everyone has the choice to respond to stress with relaxation or with more stress. By constantly reacting with a stress response, the chemicals that put one in "fight or flight" mode will wear down the body. The relaxation response can be strengthened by practicing yoga. Another element of yoga is asana (posture). For example, with a challenging pose like a headstand, someone may be scared of falling over. Their breath quickens and becomes shallow and their mind will want to be anywhere but there. With deep mindful breathing, they'll become more calm and focused. This can be applied to day-to-day life when a stressor throws one off balance and upside-down. Deep breathing, slowing down heart rate and blood pressure, and relaxing muscles will reduce the stress. Being fully present on the mat also gives one an escape from the stressors that they're currently dealing with in life. Taking care of oneself from the inside out will clear the mind and enable one to deal with those stressors with more ease and grace. Let yoga be part of every day life and reap the emotional health benefits of the practice. Everyone deserves to have improved concentration, relieved depression, and reduced stress. Everyone deserves to be happy and healthy.